An umbrella set in a deck or patio table provides protection from the elements and add a splash of color to the setting. If your table isn't equipped with a center hole that accommodates an umbrella, you can create the right sized hole using an electric drill equipped with the proper hole saw bit. Select a hole saw unit designed for cutting through your specific table material, such as wood, plastic, metal or masonry. 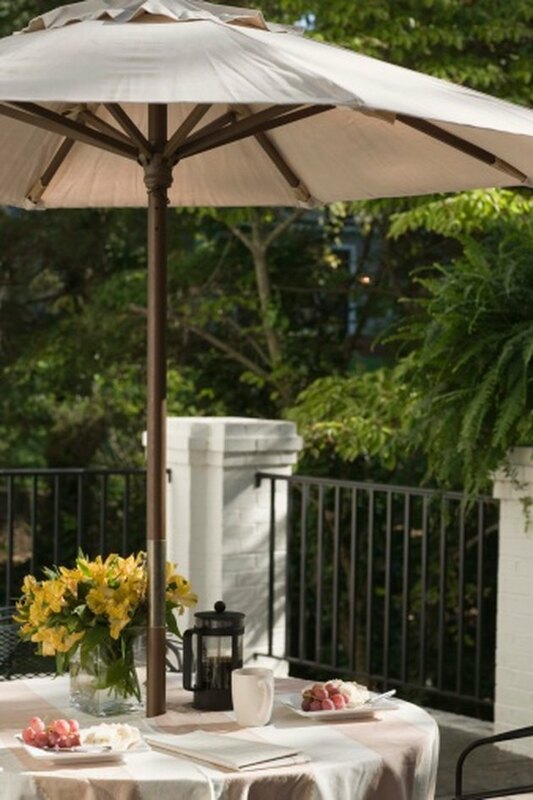 A table umbrella is especially useful for providing shade on hot summer days. Measure the diameter of the umbrella pole to determine how big the hole in the center of the table will need to be. You can obtain this dimension by placing a tape measure across the base of the umbrella post. Hole saw units are available in a variety of sizes; select a unit that is 1/4 inch larger than the diameter of the umbrella post for easy installation. Measure across the tabletop to find the center point where the hole will be drilled. Measure in a crisscross pattern, making a pencil mark at the center point. Use this technique to measure tables of all shapes and sizes. Attach the hole saw unit to the drill. The unit consists of a center drill bit which pilots the coring saw that surrounds the bit. The drill bit protrudes out from the coring unit to allow you to start a pilot hole before the outer cutting teeth reach the table surface. Rest the tip of the drill bit on the center mark made in step 2. The drill should be at a 90-degree angle when you squeeze the trigger to start the hole. Slowly penetrate the table surface with the drill bit, allowing the coring shroud's teeth to come to a rest. Allow the teeth of the hole saw to make an impression in the table before bringing the drill up to full speed. Doing so will ensure controlled hole placement. Remove any burs, splinters or rough areas with sanding paper for a finished look. If you have a wood or metal table, treat the cut area with a sealer to protect it from rotting or rusting.